Russia has been on the back foot since Germany launched the Gorlice-Tarnów offensive in May. Hindenburg and Ludendorff, the Eastern Front commanders, had been saying that they could knock Russia out of the war if Germany’s reserves were given to them. Falkenhayn, the overall German commander, was sceptical of their claims. He suspected that Russia could not be defeated in one single campaign, as the Russians could always retreat into their vast interior and raise new armies to replace ones that were destroyed. He nevertheless agreed to the offensive partly because of the prestige Hindenburg and Ludendorff enjoyed thanks to earlier victories, partly because he hoped that a big victory against Russia would impress still neutral Romania and Bulgaria. The summer long offensives have been very successful. Austro-Hungarian forces have regained lost territories in Galicia while German forces have thrown the Russians out of Poland and advanced into the ancient territories of the Russian empire. In an effort to avoid the complete destruction of their army, the Russian commanders have ordered a retreat to the east. Attempting to emulate the tactics that defeated Napoleon in 1812, Russian generals have ordered a scorched earth policy, directing their men to destroy anything that might be of use to the enemy. In many areas this has been used as an excuse to destroy the property of Russia’s maligned Jewish minority, who now are somewhat grateful to the deliverance the German advance affords them. The Eastern Front now stabilises, as the German advances stretch their supply lines and the difficult autumn weather makes it harder for them to press on. Events seem to have proved Falkenhayn correct. The Russians have suffered great losses but their armies remain in the field. They are still capable of putting up a tough fight on occasion, as the Austro-Hungarians discovered at Rovno and the Germans at Vilna. And the Russians have no intention of surrendering or seeking a separate peace, with the Tsar taking personal command of the army underlining the Russians’ commitment to the war. Still, the Russians have been dealt a hammer blow, losing many men and being obliged to surrender vast tracts of territory. And Falkenhayn’s aim of impressing the Balkan neutrals has been achieved. The Bulgarians have reached a secret agreement with Germany and Austria-Hungary, promising to join in a German-led assault on Serbia. At Loos the British have for now given up their efforts to smash through the German lines, but in Champagne the French have been pressing on. Yesterday they had some successes in their assaults on the German reserve line of trenches. At great cost they managed to breach the line in a number of places. Unfortunately today the Germans counterattack and recapture much of the lost ground. The intense fighting since the launch of the offensive means that the French are now running low on artillery shells. Joffre orders a temporary halt to further attempts to break the German line, until ammunition stocks have been replenished and fresh troops brought up to the frontline. Fearing further German counterattacks he also orders that the gains made thus far are to be made secure. The Russian counterattack at Rovno has dealt a heavy blow to the Austro-Hungarians. Despite the defeats they have endured over the summer, mainly at the hands of the Germans, the Russians show that they are still a force to be reckoned with. The Austro-Hungarians suffer perhaps as many as 300,000 in the Russian counter-attack, but now the Germans come to their aid, striking at the Russians and recapturing the Ukrainian town of Lutsk. This effectively puts an end to the Russian counter-offensive. The Eastern Front begins to stabilise. Mutual exhaustion and the worsening weather are making offensive operations increasingly difficult. Allied efforts may be bogged down in Gallipoli but in Mesopotamia they are still giving the Turks what for. A British force (mostly comprised of Indian troops) is advancing up the Tigris river. Under the command of General Charles Townshend they now attack a Turkish force defending the town of Kut. The fighting is difficult and the Turks put up tough resistance. Eventually, though, British successes put the Turks in position whereby continued resistance would mean the destruction of their force. Colonel Nurredin, the Turkish commander pulls back his army, battered but not routed by the enemy. Although the fighting at Kut has been successful, the British are still experiencing some problems. Their medical organisation seems to be a bit under-equipped for the demands of tough fighting in an arid environment. The British are also having trouble supplying their force adequately. The Tigris river is a shallow river and the waters are returning to their usual level after being unusually high for the last couple of months. This is a problem because many of the British supply boats have draughts too deep for the shallow waters. But for now these problems seem relatively trivial. With the Turks defeated in the field the British are determined to press on. The way to Kut is now open. Townsend’s men will be able to take it tomorrow. And then the British will be able to resume their advance on Baghdad. The Allies continue their Western Front offensives. In Champagne, the French try to capitalise on their costly successes yesterday, but they are unable to break through the German reserve lines. The French begin to realise that the Germans had previously decided to make their stand here and now the French suffer heavy casualties as they face the concentrated machine guns and field artillery of the enemy. In Artois the British try to continue the advance from Loos, which they captured yesterday. The British reserves have finally arrived and Haig sends them forward against the enemy. Unfortunately German reinforcements have also arrived and the British also endure great losses and are unable to make any further headway. Haig blames French, the overall British commander on the Western Front, for the failure to exploit yesterday’s success. French had positioned the reserves so far to the rear and then released them so late that they did not arrive in time to attack yesterday. Haig is well connected politically. He now begins to insinuate that French is not up to the job of commanding the British Expeditionary Force and that it is time he was replaced… perhaps by a resourceful frontline commander like Haig himself. Failures in Gallipoli are turning Allied attentions back to the Western Front. The British and French launch another offensive against the Germans, whose numbers have been reduced by Falkenhayn’s despatch of the reserves to the Eastern Front. The British are attacking the Germans near Loos in the Artois sector. The attack is being commanded by General Douglas Haig, but General John French, the senior British commander on the Western Front, has retained personal control of the British reserves. Back in April the Germans first used poison gas in their attacks in Ypres. The Allies were outraged by this barbaric new weapon but by now they have overcome their scruples. The British release their own clouds of chlorine on the Germans at Loos, in the hope of killing enough of them to effect a breakthrough. Unfortunately the wind blows the gas back to the British lines, where it causes much confusion but relatively few casualties. The British are experimenting with a new tactic, deliberately keeping back some members of attacking units so that in the event of heavy casualties there remains a core of troops around which a shattered unit can be reconstituted. This is just as well as the British suffer ruinous losses attacking Loos from the Germans’ machine guns and field artillery. But they makes some progress nevertheless, overrunning enemy positions and capturing the village of Loos itself. Haig wants the reserves released so that the successes can be exploited. 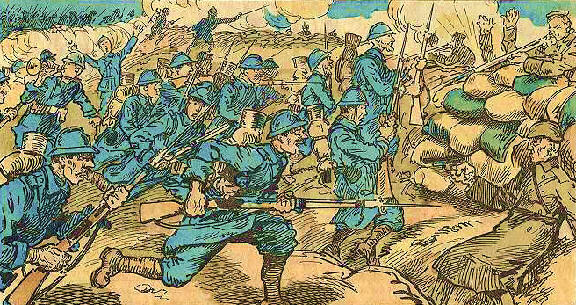 French eventually agrees to send the reserves forward but they have been stationed so far behind the line that they do not arrive by the end of the day’s fighting. The French are also attacking in Artois but they are making little progress. The main French effort is further to the south. Indeed, both French and British efforts in Artois are essentially diversions for the French offensive in the Champagne sector (also the scene of fighting earlier this year). Joffre has assembled considerable forces here and hopes to smash through the outnumbered Germans. The French have some initial successes, overrunning forward German positions and capturing some 14,000 German prisoners, albeit at great cost. However, the Germans manage to hold their reserve trench line, denying Joffre the breakthrough that he craves. 21/9/1915 The last flight of Stanley Caws. Lieutenant Stanley Winther Caws and his observer Lieutenant William Hodgson Sugden-Wilson of 10 Squadron were shot down whilst on a long distance strategic reconnaissance for the forthcoming offensive, in their BE2c (2004). They had attracted the attention of a succession of enemy planes and fought two of them off before running out of ammunition. Lieutenant Caws was killed. 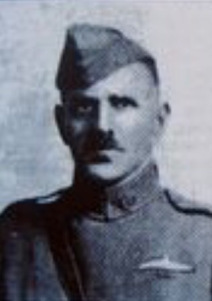 Lieutenant Sugden-Wilson was badly injured and taken prisoner.